RSNoticia! has many unique features such as, beautiful mega menus, a lot of layout options through the page builder feature and also content transitions options. 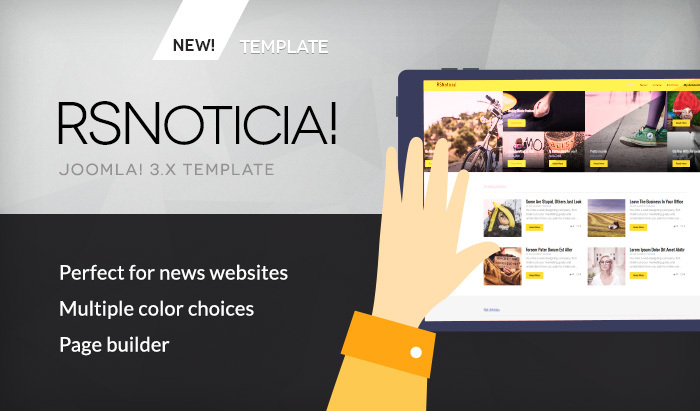 As all our templates, RSNoticia! is also fully responsive, highly flexible and compatible with Joomla! 3.x. Its responsive capabilities are brought in by the well-known Bootstrap framework, whereas the flexibility in customization is given by its multitude of configuration parameters and the built-in shortcodes feature. RSNoticia! has a dedicated section for Sample Data in the template configuration page. By selecting the sample data and clicking Install Sample Data button you will install the exact sample data that we have included on the template's demo website. The RSNoticia! module positions were suggestively defined for an easier understanding of their location and they are also easily controlled through the integrated page builder. You can re-arrange the template positions by simply dragging and dropping rows of positions to the preferred location. You can also click on the Row settings button in order to customize the background color, margin top, margin bottom, padding top and padding bottom of the selected section. RSNoticia! allows you to improve your website menu and have a better, more organized navigation with the great looking Mega Menu integration. It will also allow you to publish featured articles, including images, inside your navigation menu through the Articles - Latest module. When purchasing RSNoticia! a RSMediaGallery! subscription will be automatically added to your account for free. RSMediaGallery! Is a gallery management extension which will allow you to create a professional looking galleries within minutes from its installation. As usual, this includes lightbox and transition effects and can be published with its menu item, inside Joomla! standard articles, third party content areas and even in module positions. Hello, I would like to know until wordpress version is worth this template and if it is multi-lingual all the sections of the template. What was the date of the last update that was made.